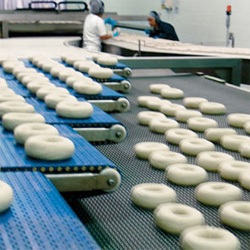 Benchmark designs and manufactures a complete line of automation equipment tailored to the unique challenges of food and bakery manufacturers. 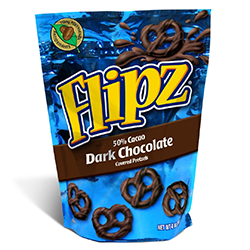 Our robust capabilities include slug loading, product stacking, row distribution, product orienting, automatic wrapper infeeds, vibratory distribution, robotic loading, and intermittent motion horizontal form fill and seal systems. Our products and devices allow our customers to take control of their production line efficiency. 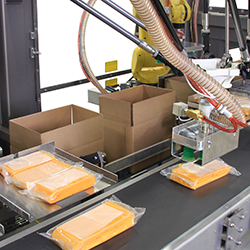 Benchmark's InFlight line of automatic infeeds are designed to automate product loading into horizontal wrappers or cartoners. Our custom automatic infeeds are designed to meet your specific product specifications while providing superior performance, reliability and increased productivity. Designed to handle product backlogged or not, our automatic cartoner infeeds are the perfect packaging solution. 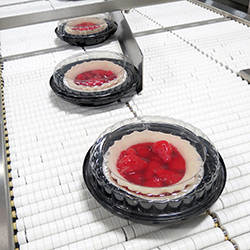 Learn about our comprehensive turnkey distribution systems for baked goods, bars, cookies, crackers, and frozen foods. Gentle product handling with high-speed tray loading. Discover Benchmark's orienting devices for accurate product positioning within your line. Find a variety of belt and chain conveyor options including vibratory, inverting, and ergonomical stepped packing table conveyors. View our pouch machinery and systems by Southern Packaging.